It happens to us all in middle age. We put on a bit of weight but, if we’re lucky – like Lunar’s Ariva – we actually start to look a bit better, more distinguished even. 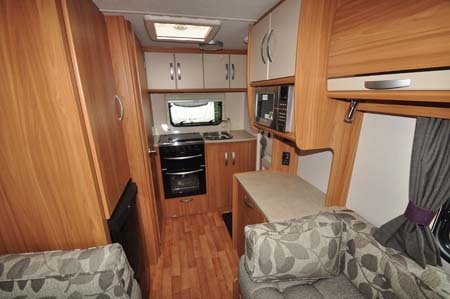 And maybe, just maybe, smaller caravans like this are about to relive some of their youth. Almost unnoticeably, the Ariva has been a steady seller for Lunar ever since it was introduced – way back in 1995, when it was a replacement for the much-loved Meteor. 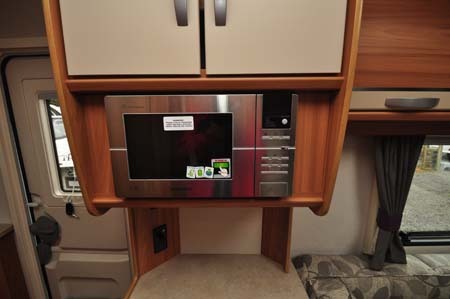 It was also available in four-berth format initially, but it’s this two-berth, end kitchen layout that has endured. In recent years, it’s been amalgamated into Lunar’s Quasar range but the truth is, it has very much its own identity as a tinier tourer. Recent diets have worked, though. It’s heavier than when it was born, of course, but is currently down to a maximum weight of a trim 970kg, with some 113kg of payload margin in that figure. Overall length and width may have grown – ever so slightly – but today’s Ariva actually sees it boasting its highest list of standard equipment ever. And still it can be towed by… well, just about anything that can handle a towbar, to be honest. The Al-Ko hitch stabiliser might add peace of mind, but this is a cinch to tow. And distinguished certainly does describe the exterior look, largely because Lunar has stuck with a more traditional three-windowed front rather than going with current trends. Funnily enough, not everybody wants a “panoramic sunroof”… although those natty alloy wheels are a pointer towards modernity. 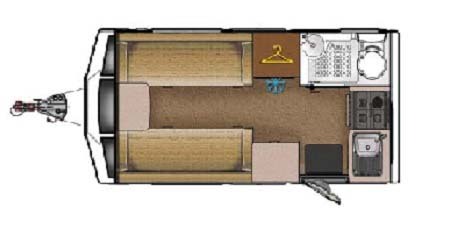 Inside, those interior-sprung settees are 6ft 1in (1.86m) long, so could be feasible as single beds for some, while the double is a generous enough 1.86m x 1.86m (ie 6ft 1in square). There’s no reason not to be cosy, either. The Truma Combi 4 heating and hot water system operates from both gas and mains electricity, with two blown air outlets at the front of the lounge. The chef fares well enough, too. 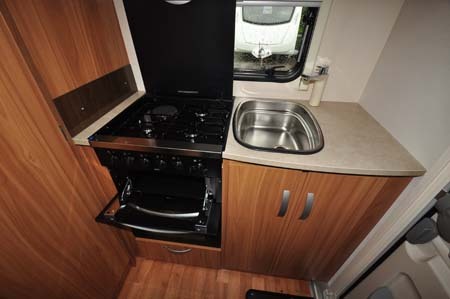 It’s a full-facilities cooker at the back – with dual-fuel hob (three gas rings, one electric hotplate) and separate oven and grill. In case that’s not enough Lunar also fits a microwave oven as standard these days. Alongside the hob is a sink, with space to its right for an add-on drainer when washing-up, or invaluable worktop otherwise. In fact, there’s more countertop the other side of the doorway, where the microwave is also located, at a sensible eye-level (for most) height. The fridge, meanwhile, occupies space under the wardrobe. 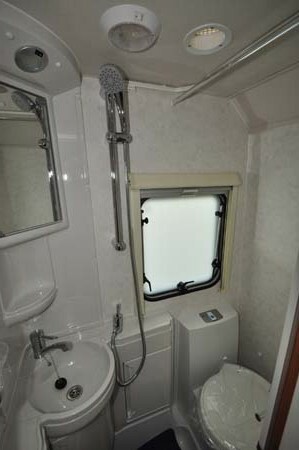 It’s the washroom that’s the more obvious step back in time, with mouldings and a vanity unit of yesteryear, and a clingy shower curtain – despite the fitting of a swivel-bowl toilet, water-efficient “eco-camel” showerhead and practical features such as a window and a hanging rail for wet gear. Those looking to keep costs of insuring the caravan down may wish to part with the £229 for the optional AL-KO Secure wheel lock which is worthy of a sizeable premium saving. So, it might be smaller than the rest, but it’s wiser. 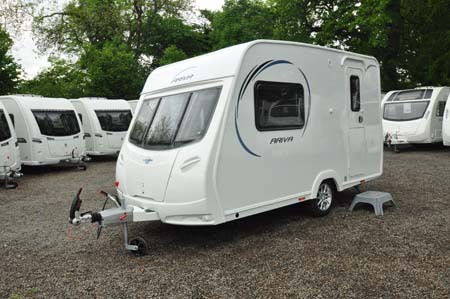 If you’re downsizing your towcar, you might have to do the same with your caravan. 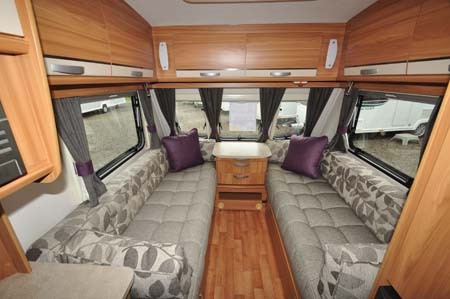 If you want a two-berth that’s going to cost you a whole lot more to own, not just initially but versus ever-rising running costs, perhaps it’s time has come – again. It definitely has youth on its side. 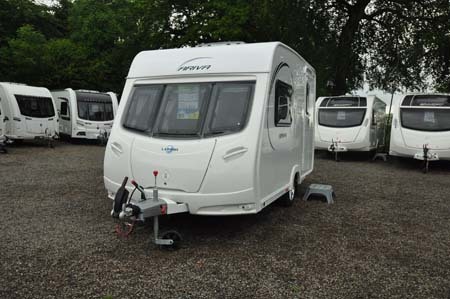 There’s more information on the Lunar range on the Lunar website and to find out more about our low-cost premiums visit the caravan insurance discounts page.